A SOLUTION TO SLEEPLESS NIGHTS & ENDURING NIGGLES- CONTURA. SCIENTIFICALY DESIGNED THAT MIRRORS THE SHAPE OF THE HUMAN BODY, THIS PILLOW IS AN SOLUTION TO STIFF NECKS & SORE BACKS. MEMORY FOAM OR VISCO-ELASTIC FOAM IS A PRODUCT DEVELOPED BY NASA. THIS SPACE AGE TECHNOLOGY IS INCORPORATED IN THE PILLOW TO DELIVER A FUTURISTIC SLEEP SOLUTION. SLOW RECOVERY FOAM PROVIDES ENHANCED SUPPORT AT THE CURVE OF THE NECK & TOP OF THE SPINE. THIS REDUCES NUMBNESS CAUSED BY STRESSED NERVE ENDINGS. 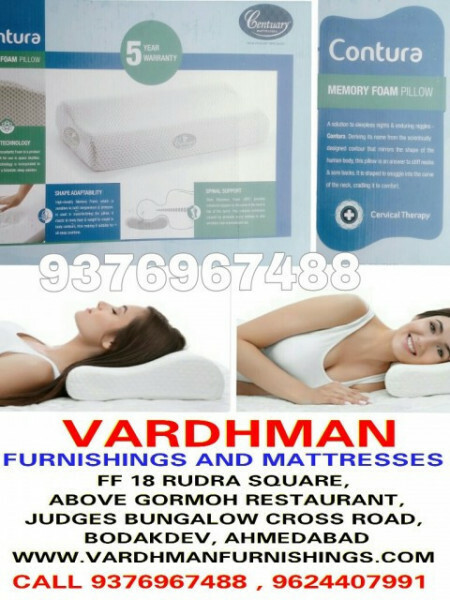 HIGH DENSITY MEMORY FOAM IS SENSITIVE TO BOTH TEMPERATURE & PRESSURE. IT REACTS TO BODY HEAT & WEIGHT TO MOULD TO BODY CONTOURS FOR PEFECT SLEEP POSITIONS.